Our Hero Farmer, I met him on his field working on his land at 45 degree centigrade. He met me with a sweet grin on his face showing that he's not tired a bit working on his land under such a high temperature. Friends this is the real story of a farmer in his area, Narad along with his all family members work either as a labor or work on farm to earn their livelihood. He has a big family of 8 members. Narad, his wife and 6 children, all of them work as a labor to fulfill their basic needs. His children are deprived of education at such a tender age, which is very fateful. Although Narad has big land where he can do agriculture and earn enough to run his family and stop his children from doing labor. 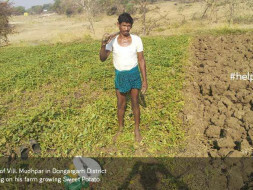 But due to lack of proper irrigation facility in his area Narad can not grow the crops properly. He mentioned me that there is water canal in his area, but it's dried. There is one tributary river also which is also dried. Also government officials don't pay any attention to this area. I have discussed with Narad that if he get a bore-well done on his land, it would be very easy for him to do agriculture on his land and get a good income from his land. Currently his situation is like that he don't even earn 20,000 also from his 1 acre land, due to lack of water for irrigation. The cost for bore-well in his area is near about 40,000-50,000 INR and installation of submersible pumps will be upto 25,000-35,000. Approx. 80,000 will be the cost i.e. to be raised and this would be enough for getting the bore-well done on his farming land. On the behalf of Narad, I Suryakant Sao from Rajnandgaon district is urging the kind heart peoples living on earth to support this HERO FARMER, as he has the will to improve his condition and he never cries before the challenges he faces in his life. As Narad is so poor that he cannot afford a mobile. In order to help Narad, please use the 'Contact Organiser' option below.